Finishing with a clam shell crimp or finishing with calotte crimps will give a professional smooth finish to your creations. 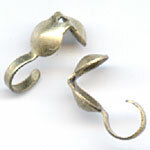 Unlike the side-opening calottes, these clamshells have an end-opening as well as a hole in the fold-section. If you are cutting the length of wire you need ahead of time, allow at least 4-5 cm extra on each side to attach your fastener. 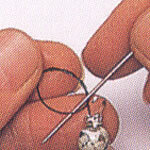 1) After cuttinng the length of thread you need including the extra lengths, make a secure knot at one end. A double overhand knot would do well. Thread on your clamshell crimp, with the cups facing the knot. Trim away any excess thread after the knot. Close the clamshell over the knot using your fingers and tighten gently with a flat-nose plier. Thread on the beads you want. 2) After you have strung your beads, thread the other clam shell crimp with the cup facing away from the beads. 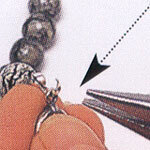 Make another double overhand knot and before you tighten the knot, place a strong blunt needle into the knot. 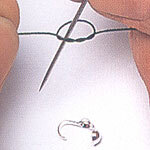 Use the needle to slide the knot down towards the hole in the clamshell, tighten the knot as you go. 3) Close the clamshell over the knot as before. To attach the clamshell to a fastener, place the fastener into the open loop and using a long-nose plier, gently round & close the clamshell's open loop. If the loop on the clamshell is originally closed, open it sideways with a plier. Close it the same way.